Would you like to have a sobering experience? A change perhaps from the sights and stimulus of Manhattan? See a place that's not an attraction or a "secret" because there is nothing particularly attractive about it or a reason to keep it a secret? A reality check? I suggest you pick a hot summer August Sunday, when most New Yorkers with the means have made a mass exodus from the city. Take a long ride on the A train to a working class neighborhood whose very name is in itself baffling, Ozone Park, and ironically, does not even have a major park. When I got off the train at Rockaway Blvd in Queens, I found graffiti to be the art du jour and unkempt weeds to be the alternative to topiary. And apparently the aspirations of many men was to win the exacta at the neighborhood OTB (NYC's chain of racetrack betting parlors). See my set of photos from the adventure here. This was a place where carrying a pro camera raises eyebrows - people are understandably suspect to see someone taking photos of nondescript houses or unassuming commercial buildings. Coincidentally, as I was having this exact thought, I was queried by a merchant sitting outside his shop in a lawn chair as to why I was taking a photo of a gas station. It took quite a bit of of persuasive conversation to convince him of the sense of my mission and activity. That the reason I was doing it was because there was no good reason to do it and specifically because the whole situation was so remarkably unprepossessing. 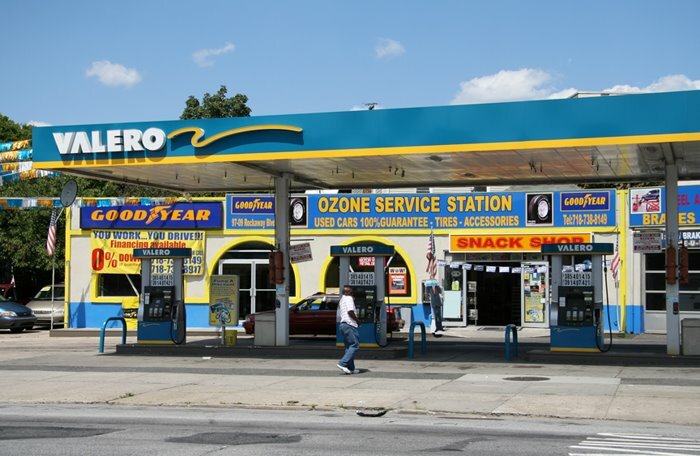 I hope not to offend any Ozone Park residents as I am sure there are good things to be found there and admittedly the areas around train stations and major thoroughfares (where I was) are typically not very attractive. Actually, Ozone Park does have a few claims to fame. It is the former home of the infamous John Gotti and his associates in the Gambino crime family. The Mafia boss died in prison in 2002.